Julia graduated from the Ludwig Maximilian University Munich, Germany in 2008 after finishing medical school. Since 2006 she has been studying the expression and function of innate immune receptors in inflammatory kidney diseases. During her medical thesis, Julia investigated inflammatory effects of necrotic cell death in primary mesangial cells. In this study it was shown that necrotic cells activate mesangial cells in a Tlr2/MyD88-dependent fashion. This was the first evidence that danger-associated molecules have an immunostimulatory effect on glomerular mesangial cells, which is mediated by innate immune receptors. She also contributed to studies investigating the role of viral RNA and DNA inducing type I interferons in mesangial cells. Later, she concentrated on the role of inflammasome signaling in intrinsic glomerular inflammation and studied the contribution of resident renal cells, including renal dendritic cells in IL-1β induction in the kidney. Recently, while training clinically in nephrology, Julia studied the therapeutic effects of activated protein C in a mouse model of systemic lupus erythematosus and lupus nephritis. In continuation of her previous studies on immune mechanisms in inflammatory kidney diseases, she plans to extend her focus to the repair and regeneration processes in kidney injury. 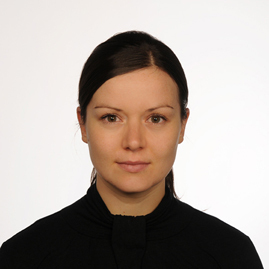 Julia obtained her research funding from the Deutsche Forschungsgemeinschaft (DFG). While not working, Julia enjoys all kinds of mountain sports, especially skiing on volcanoes. Lichtnekert J, Rupanagudi KV, Kulkarni OP, Darisipudi MN, Allam R, Anders HJ. Activated protein C attenuates systemic lupus erythematosus and lupus nephritis in MRL-Fas(lpr) mice. J Immunol. 2011 Sep 15;187(6):3413-21.